Professor Bi has been with the Department since 1997. He has established an internationally recognized research program with excellent industrial support from Canadian and International organizations. He has made outstanding scientific and technical research contributions with impact in the field of fluidization and fluid-particle flow systems and bio-energy. Dr Bi has also led the development and introduction of courses in the area of green process engineering. 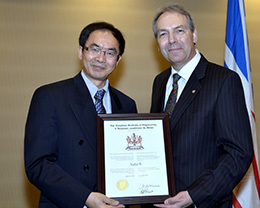 The Canadian Academy of Engineering is the national institution through which Canada’s most distinguished and experienced engineers provide strategic advice on matters of critical importance to Canada.